View of the Military Roads in the County of Wicklow, Ireland. 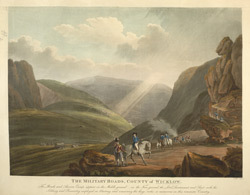 During the 18th century the British Army built a network of roads across the Wicklow Mountains. These roads were used to move soldiers into the more remote areas of Wicklow to control the rebellious clans living there. Construction of the roads was not simple or easy, work began in August 1800 and was not completed until October 1809. Starting in Rathfarnham in County Dublin the road was 34 Irish miles in length and ended in Aughavannagh. An Irish mile was 2240 yards in length in contrast to an English mile which was 1760 yards. The engineer responsible for the construction of the road was Alexander Taylor and total costs came to £43,587.